I got back from Las Pavas on Thursday. In the middle of the night the diarrhea hit. That gave me an excuse to miss the media workshop on Friday and try to rest up. Guess how easy it is to take a nap in a concrete building when the temperature outside is 106 degrees. Today, Saturday, I am much improved. The temperature dropped at least ten degrees, thank God, since we had a six hour team meeting. Tomorrow I head up the river again, this time for Garzal. Las Pavas is a river community of farmers who, over a period of years, had been living on and working several thousand acres of lowing lying land in the Magdalena River Valley. Remember that the Magdalena is the Colombia’s equivalent of our Mississippi except that it flows north. This community was participating in a government program to reclaim abandoned land. They had passed the initial steps and were told their titles were “in the works”, so to speak, when the uncle of the previous owner sold the land to a British palm oil producer, Daabon. The previous owner was actually the notorious drug lord Pablo Escobar, who was killed in 1994. CPT got involved with Las Pavas just prior to their being evicted by the national police. They now live in the little town of Buenos Aires, pictured above, that adjoins Las Pavas. We have been accompanying the community and working to draw international attention to their situation ever since. Part of our strategy has been to focus on one of Daabon’s biggest customers, a chic, socially responsible cosmetics company. That company, The Body Shop, began in the late seventies as one of the first companies to use a “fair trade” model. They have been very successful using big posters of the poor farmers in the world who are benefiting from their business. CPT has organized public actions in Chicago and London which have made The Body Shop very uncomfortable. See the following link for more details on CPT’s history with Las Pavas, http://www.cpt.org/work/colombia/actions. My role on the visit was to hear stories first hand and to see what was happening with the development of the land by Daabon. The man pictured here is Efrain, an incredible historian, storyteller and song writer. I spent about three hours learning about the history of Las Pavas. 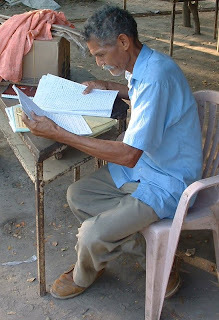 He is nearly blind, and when he writes his eyes need to be about six inches from the page. Our second day there, my CPT partner Gladys and I went on a motorcycle tour of the former farmlands, now a palm oil plantation in progress. It was grim. The Magdalena river valley is a huge network of lakes, swamps, and channels that flood seasonally. The Las Pavas community was planting cacao (chocolate), plantains, and other cash crops in higher areas and leaving areas of forest specifically for timber. Lakes, rivers and streams provide water and fish. What I saw was several thousand acres of forest totally cleared. Stream channels and swamps were being filled. It is wetland destruction on a huge scale. We actually got to take photos of bulldozers clearing trees, piling them up and burning them. The photo below is of Gladys and our motorcycle chauffeurs posed on one of the trees taken down. There is a judicial process. We know of another community that has been in the same kind of judicial process for 8 years. CPT and several other human rights organizations, national and international, are working to see that this doesn’t happen to the people of Las Pavas.